December 2014. 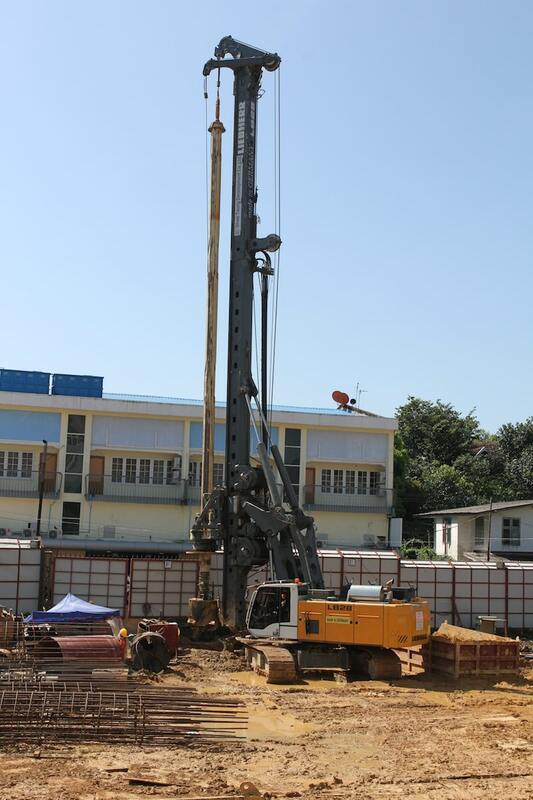 Geo-engineering specialist Golden Tri Star Co is using the first Liebherr rotary drilling rig in Myanmar to bore piles for a condominium in Yangon’s embassy district. The first Liebherr LB 28 drilling rig to be delivered to Myanmar is now working on its second project after successfully completing foundation drilling for one of Yangon’s largest commercial projects. The rig has started bored piling work on The Illustra At Pho Sein, a 31-storey condominium project, being built on Pho Sein Road in Yangon’s premier Kandawgyi Lake district, which includes the city’s embassy quarter. Developer of the project is PSWN Development Company Ltd, who have subcontracted geo-engineering specialist Golden Tri Star Co Ltd (GTS) to carry out the foundations work. GTS is the owner of the LB 28, and is a division of Shwe Taung Group, the company that is developing the Junction City project in downtown Yangon, which is where the rig made its debut on the foundations before being moved to The Illustra. Mr Phyo explains there are three sizes of pile to be installed. A total of 11 piles, designated T-1, will have a diameter of 800 mm and will be sunk to a depth of 55 m. Type T-2 will total 62 piles, and have a diameter of 1,200 mm. These will be sunk to 57 m, as will the total of 66 type T-3 piles, which will have a diameter of 1,350 mm. “Despite the depth of the piles, we are not reaching bedrock,” says Mr Phyo. “Much of this part of Yangon has this very soft, silty, wet soil, as we are very near to the Yangon River.” The first piles that have been bored are type T-2 with each boring has taken between eight and nine hours. “We really learned how to make the most of the LB 28 when we used it on the Junction City project,” says Mr Phyo. “Moving to The Illustra immediately after completing our work on the first project means that we have the necessary operational experience for the machine.” GTS’s foundations contract is for a duration of four months. The Illustra is due for completion in 2016. The LB 28 features an operating weight of 93 t and offers a maximum torque of 320 kNm and a maximum push/pull force of 400 kN. Powered by a 390 kW diesel engine the rig can drill to a depth of 70 m and a maximum diameter of 2,500 mm.